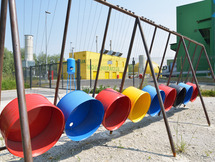 Educational trail of Regional centre for waste management (RCERO) is a landscaping project surrounding the regional waste management facilities. It has eleven theme points that educate visitors about types of materials, recycling and re-use of waste. At each of the theme points, prostoRož..